Professor Abdulnaser Sayma and Dr Martin White will lead on a turbomachinery work package within the €5m Horizon 2020-funded project, ‘Supercritical Carbon Dioxide/Alternative Fluids Blends for efficiency upgrade solar power plants (SCARABEUS)’. Engineering academics at City, University of London have received EU-funding to develop innovative clean energy technology solutions. Professor Abdulnaser Sayma (Principal Investigator) and Dr Martin White (Co-Investigator) have been awarded €707k to lead the turbomachinery work package of the €5m Horizon 2020-funded project, ‘Supercritical Carbon Dioxide/Alternative Fluids Blends for efficiency upgrade solar power plants (SCARABEUS)'. The SCARABEUS project, starting in April 2019 and lasting four years, will demonstrate that the application of supercritical CO2 blends to concentrated solar power (CSP) plants has the potential to reduce capital expenditure for state-of-the-art steam cycles by 30 percent, and operating expenditure by 35 percent, thus exceeding the reduction achievable with standard supercritical CO2 technology. This translates into a levelised cost of electricity (LCoE) which is lower than €96/MWh or 30 percent lower than currently possible. The project will demonstrate the innovative fluid and newly-developed heat-exchangers at a relevant scale (300kWth), for 300 hours, in a CSP-like operating environment. Supercritical CO2 refers to a fluid state of carbon dioxide held at or above its critical temperature and critical pressure. Concentrated Solar Power Systems (CSPs) generate solar power by using mirrors or lenses to concentrate a large area of sunlight, or solar thermal energy, onto a small area. Electricity is generated when the concentrated light is converted to heat, which drives a heat engine (usually a steam turbine) connected to an electrical power generator. Alongside City, the academic and industry partners on the SCARABEUS project include Politecnico di Milano (overall project coordinator); Technical University of Wien; University of Seville; University of Brescia; Kelvion; Quantis; Exergy and Abengoa Energia. 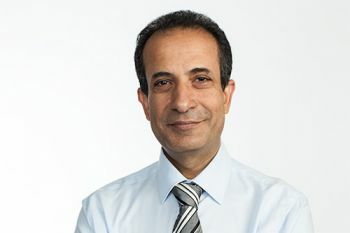 Professor Sayma and his colleagues have successfully developed state-of-the-art micro gas turbine technology operated by solar power capable of generating up to 6kW of electricity.